Members of the First Church of the Nazarene in Gallipolis recreate the nativity earlier this week in Gallipolis City Park. Many local churches will be hosting their own live nativity events throughout the season as a part of Gallipolis in Lights. GALLIPOLIS — The true meaning of Christmas can be found in City Park with a season of live nativity scenes happening as a part of Gallipolis in Lights. 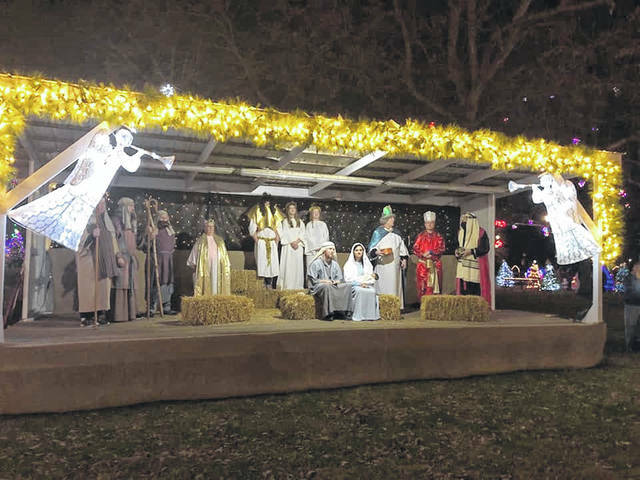 The live nativity events are held on the Court Street side of the park and take place from 6-7:30 p.m., with various local churches rotating and recreating the Greatest Story Ever Told. The latest schedule is as follows: Wednesday, Dec. 5, First Presbyterian Church; Friday, Dec. 7, Saint Louis Catholic Church; Saturday, Dec. 8, First Baptist Church; Sunday, Dec. 9, Grace UM Church; Wednesday, Dec. 12, Paint Creek Church; Friday, Dec. 14, River City Fellowship; Saturday, Dec. 15, Elizabeth Chapel Church; Sunday, Dec. 16, River of Life Church; Wednesday, Dec. 19, First Church of God; Friday, Dec. 21, Rodney Church of Light; Saturday, Dec. 22, Mercerville Church. In addition, to the Christmas lights and live nativity, Santa will be residing in his “Santa house,” taking the wish lists of good little girls and boys. Santa’s schedule is as follows: Wednesday, Dec. 5-Friday, Dec. 7, 6-9 p.m.; Saturday, Dec. 8, immediately following the Christmas Parade; Dec. 9-Dec. 14, 6-9 p.m.; Dec. 15, 1-4 p.m. and 6-9 p.m.; Dec. 16, 1-5 p.m.; Dec. 17-18, 6-9 p.m.; Dec. 20-21, 6-9 p.m.; Dec. 22, noon – 3 p.m.; Dec. 23, 1-4 p.m., 6-9 p.m. Santa returns to the North Pole on Dec. 24. The Santa House is located on the Second Avenue side of Gallipolis City Park. Admission is free to Gallipolis in Lights though donations are appreciated and can be made at the donation station which is the small gingerbread house near the bandstand on the river side of City Park. The light display is on every night from dusk to dawn until Jan. 1. For more information and scheduling updates, follow Gallipolis in Light on Facebook.